Terms and Conditions must be accepted through your UNA Portal. Once you have read and accepted the Terms and Conditions, please navigate back to your UNA Portal account and click on the "Accept Award Offer tab. You must then accept or decline each award offer. 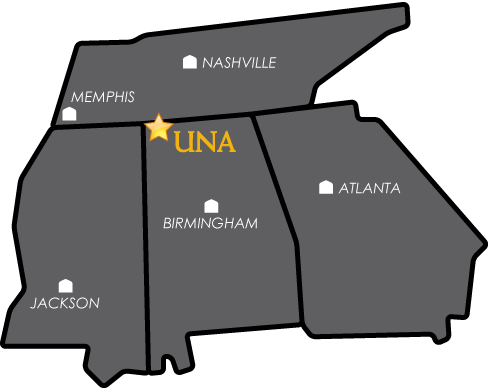 You must be enrolled as a degree-seeking student at UNA. Special students, transient students, early scholars, and unclassified students ARE NOT ELIGIBLE for federal student aid, including Federal Direct Stafford Loans and Federal Direct PLUS Loans. Your award is based on the assumption that you will be enrolled full-time. Full-time status is 12 credit hours for undergraduates and 9 credit hours for graduate students, in courses leading to your degree program. To be eligible for most financial aid you must be enrolled and maintain at least half time status. If you drop classes, withdraw, or make other academic changes, your financial aid awards may be adjusted and repayment may be required. Federal grant awards are based on full-time enrollment of 12 credit hours per semester. If you enroll less than full-time, your financial aid awards, including the Federal Pell Grant, and the Federal Supplemental Educational Opportunity Grant (SEOG), will be reduced or canceled. Please Note: Your Summer financial aid award offer(s) will be manually processed based upon your initial enrollment. If you make changes to your schedule prior to the Summer freeze date, please contact our office for review. If you stop attending classes without officially withdrawing, your financial aid awards may be adjusted and repayment may be required. If you drop below 6 credit hours in any semester, all remaining student loan disbursement(s) in the current academic year will be canceled. You may request that you be re-awarded student loan money for the remaining semesters in the academic year. It is your responsibility to request re-awarding of your student loan money. Your student loan for the following semester will be disbursed in two installments, with one-half of your loan funds disbursed at the beginning of the next semester and the second half of your loan funds disbursed at mid-semester. If you receive Federal Student Aid (except Federal Work Study) and subsequently withdraw from all course hours during the semester, you are subject to federal regulations regarding complete withdrawal. If you have not completed at least 60% of the academic semester, you may have to return a portion of the Federal Student Aid to the University. You will be responsible for repaying any funds you receive that exceed your financial need, or if for any reason, you become ineligible for the financial aid. You may receive Federal Student Aid at only one college or university during the semester. UNA reserves the right to reduce or cancel your awards at anytime. Revisions/Cancellation may result from changes in admission status, enrollment, classification, residency, housing status, changes in the availability of funds, or receipt of other awards. 1. Grade Point Average (GPA). The student must meet the University’s minimum academic GPA requirements for the student’s respective academic class level. Refer to the Scholastic Standards section of Academic Procedures and Requirements in the current UNA catalog. 2. Percentage of Course Hours Completed. A student must complete at least 75% of all course hours attempted at UNA. All course hours attempted at UNA, including any course hours which may have been dropped or for which the student did not receive a passing grade, are included in this calculation. Effective July 1, 2011, any transfer course hours accepted by UNA will be included in this calculation. There is no academic forgiveness of course hours attempted for federal calculation purposes even though the student may apply for and receive the benefit of the University’s repeat/recompute policy or Second Chance provision. 3. Maximum Time Frame. A student is allowed a maximum of 172 course hours to complete undergraduate degree requirements for a 1st degree and a maximum of 216 course hours to complete the requirements for a 2nd undergraduate degree. Complete details on the University’s Satisfactory Academic Progress Policy, including reinstatement and appeal options, are available at http://www.una.edu/financial-aid/satisfactory-academic-progress.html or upon request from Student Financial Services. 34 CFR 668.2: Amends definition of full-time student to allow repeated coursework to count toward enrollment status in term-based programs. Students may repeat previously passed courses only ONCE and receive financial aid. Students may repeat a failed course(s) until it is passed and receive financial aid as long as Satisfactory Academic Progress is maintained. Scholarship funds will be credited to your UNA student account. The University of North Alabama will not pay any amount of your scholarship award directly to you in the form of check, cash, direct deposit or debit card. Payment of your scholarship award is contingent upon funds being provided by the University of North Alabama or the University of North Alabama Foundation. All scholarship awards are subject to change depending on fund availability, budgetary constraints, and the size/quality of the applicant pool. Only U. S. citizens are eligible for Excellence Scholarships and Phi Theta Kappa Transfer Scholarships. Students being offered UNA excellence scholarships, including, but not limited to, Academic, Leadership, Valedictorian/Salutatorian, Regional, Presidential Mentors, Vanguard, will be officially notified of their scholarship award by a letter from the Student Financial Services Office signed by the President of the University. No University employee or official other than authorized officials in the President’s Office, the Director of Student Financial Services, or the Director of Admissions, may approve changes or alterations to offers of excellence scholarships. Any other scholarship offer, change, or alteration by any other UNA employee SHALL NOT be legally binding upon the University. Excellence Scholarships are for incoming freshmen entering UNA immediately after graduation from high school. As a rule, a student may receive no more than one UNA Excellence Scholarship. Phi Theta Kappa Transfer Scholarships are for students transferring immediately to UNA from a two-year community college. Students who have attended four-year institutions ARE NOT ELIGIBLE for the Phi Theta Kappa Scholarship. All scholarship offers are time sensitive and must be accepted by the date specified in your scholarship award letter. Scholarship offers are subject to cancellation if not accepted within the stated offer period. The Office of Student Financial Services (SFS) will check grades of all first-year Excellence Scholarship recipients at the end of the fall semester. SFS will cancel the spring semester scholarship award for any Excellence Scholarship recipient who earns a 2.30 semester GPA or less in his/her first semester at UNA. Students who receive a university scholarship must meet the renewal criteria outlined in their award letter, to include meeting minimal GPA requirements and pass 27 hours within the academic year. Each respective academic department or college may send their own scholarship award notification to the student(s) selected for ENDOWED scholarship awards by the department or college. HOWEVER, scholarship award notification letters sent by the academic departments or colleges are not official and shall not be legally binding upon the University. The official notification of the scholarship award will come from the Office of Student Financial Services in a letter signed by the President of the University, or his designee, AFTER VERIFICATION OF FUNDING FOR PAYMENT OF THE SCHOLARSHIP OFFER HAS BEEN VERIFIED. You must enroll in at least 12 undergraduate hours at UNA each semester for which this scholarship is payable in order to receive credit for the scholarship. Credit hours for which you register at another university will not be considered to achieve a total of twelve (12) or more undergraduate enrolled hours. Fixed dollar amount scholarship awards are payable to your UNA student account if you are registered for twelve (12) or more credit hours per semester. These fixed dollar scholarship awards are payable 50% in the fall semester and 50% in the spring semester. Non-resident fee scholarships are awarded under a separate, specific scholarship agreement. A Non-Resident Fee Scholarship may pay an amount less than the full non-resident fee charged to you by the University. Your scholarship award pays for undergraduate course hours only, unless specifically stated otherwise. Your scholarship award may increase or decrease from semester to semester and year to year, depending on the number of credit hours (12-16) for which you register and the availability of funds provided for scholarships of the type for which you are eligible and for which you have been awarded. It is your responsibility to be aware of the amount your scholarship is eligible to pay. Your scholarship award is NOT PAYABLE for graduate course hours, even if you should enroll in graduate courses at the same time you are enrolled for undergraduate courses. Any graduate hours for which you might be enrolled will not be included with undergraduate hours to achieve a minimum total of 12 hours for the semester. If you do not fulfill the terms applicable to the scholarships, you may be required to repay all or part of the scholarship. If you drop classes or withdraw after receiving credit for the scholarship, any refund will be distributed proportionately to the scholarship account, according to the established UNA policy. For example, if your tuition charge is reduced by 50%, then your scholarship award will be reduced by 50%. Your scholarship award is payable for fall and spring semesters ONLY of the academic year, unless specifically stated in a separate scholarship agreement. You must enroll in consecutive Fall-Spring semesters to continue to receive your scholarship. Your scholarship is not eligible to be deferred to a later semester or a later academic year than what is stated, unless specifically approved in writing by the Director of Student Financial Services. You must meet minimum renewal requirements for grade point average (GPA) and minimum credit hours earned in the fall and spring semesters if your scholarship is subject to renewal to the next academic semester or academic year. It is absolutely your responsibility to be aware of the minimum renewal requirements for GPA and credit hours earned for your scholarship to be renewed from semester-to-semester or year-to-year. The Office of Student Financial Services is not responsible or liable for reminding or notifying you of the minimum renewal requirements for your scholarship. You may request this information from the Office of Student Financial Services. Your scholarship will not be renewed to the next semester or next academic year until the minimum academic requirements for your scholarship renewal have been recorded and posted by the Office of the Registrar. It is your responsibility to ensure that grade reports from another university, either foreign or domestic, are provided to the Office of the Registrar for recording and posting. It is your responsibility to ensure the timely delivery of service reports, if any, associated with your scholarship award before consideration can be given to the renewability of your scholarship. Your failure to read and understand these terms and conditions neither releases you from the responsibility of complying with these terms and conditions, nor from the liability associated with the loss of your scholarship award for failure to meet the academic renewal requirements. Under the Family Educational Rights and Privacy Act (FERPA) of 1974, and as amended, I understand that my educational records cannot be released without my written permission. I therefore authorize the release of my education records from the University of North Alabama (UNA) to my Endowed Scholarship donor in order to share educational records without violation of FERPA. I understand this release agreement will be in effect as long as I am receiving an Endowed Scholarship from said donor and I have the right to rescind this release agreement at any time by notifying the Office of Student Financial Services at UNA. The financial aid is disbursed based on your enrollment at that time. If you have received financial aid and are not enrolled full time, your aid will be reviewed and possibly adjusted after drop/add. If you are planning on dropping classes and/or being enrolled part time (less than 12 hours) please do not cash or spend your financial aid refund and contact the Financial Aid Office for them to review your financial aid award based on your anticipated part time enrollment status. You will receive financial aid in two installments (one half is disbursed for fall semester; the second half for spring semester), unless otherwise noted. Disbursements are made directly to your student account. If you are a first-time freshman student borrower, your first loan disbursement will be delayed until 30 days after the beginning of your first term at UNA. This will occur only during the first semester of the student’s attendance at the university. If you are receiving a federal student loan for one semester, i.e. Fall term only or Spring term only, your loan will be disbursed in two installments with one disbursement at the beginning of the semester and the second disbursement at mid-semester. If the total financial aid paid to your student account exceeds your total charges, a refund check will be issued to you by the UNA Office of Student Accounts. Outstanding requirements may prevent your financial aid from disbursing in a timely manner. To prevent this from occurring, please check your outstanding requirements by logging into your UNA Portal account, clicking the Self-Service Banner tab, Financial Aid, Eligibility, then selecting the applicable award year. When all requirements have been met, your financial aid will disburse into your student account here at UNA. Federal aid funds will pay tuition, fees, contracted room and board (where applicable), and other related educational expenses, including, but not limited to, charges from Health Services, the Library, the Housing Office, and Campus Police. If all charges have been paid and a credit results, remaining federal funds will be returned to the student via a refund check. Institutional scholarships are applied toward the payment of the University of North Alabama tuition and fees, on-campus room and board, and textbooks at the UNA bookstore. Scholarships may have additional award criteria, specifics, or restrictions - please review your award letter carefully for individual and/or endowed scholarship guidelines. Institutional scholarships are non-refundable. Refer to the Business Refund Policy for additional information. Refund checks will not be available before the first class day of each semester. The Financial Aid Office sends all communication to your UNA e-mail address. It is your responsibility to keep your UNA e-mail account active and to check your messages frequently. Be sure to file a renewal FAFSA each academic year to continue receiving financial aid.